Southern cooking sometimes gets a bad reputation. People ask if it's all Paula Deen and fat back. While yes, we do have those things, it's so much more than that. I would argue that southern food has the richest traditions in the country. It's about seasonal, fresh food that you harvest yourself - ask any born and bred southerner how many hours they spent on their porches shelling beans and shucking corn. It's about family and fellowship - go to any little old lady's house after church on Sunday and you'll definitely find a veritable feast to feed any and all visitors and kinfolk. And it's about tradition - every family has their own recipe for biscuits, pimento cheese, and banana pudding. I love it when I find other chefs and authors who feel the same way as I do. Virginia Willis is one of my favorite cookbook authors and southern women, and her cooking embodies what I love about southern cuisine. Heavily steeped in tradition and family, seasonal, with fun twists to update classics. 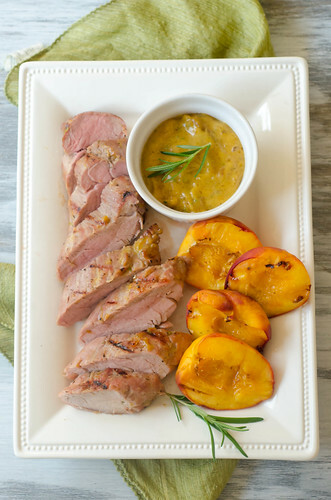 Peaches and pork are both iconic in the south, and this dish combines the two in a super fast, easy, and delicious dinner. Pork tenderloin is briefly brined in a brown-sugar salt mixture, then grilled. 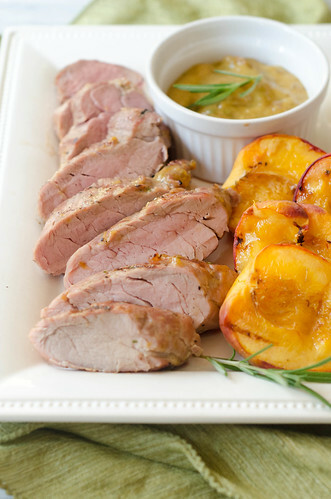 As it finishes up on the grill, it's brushed with a sweet and spicy glaze of peach preserves and Dijon mustard. I grilled some peaches on the side because - hey - it's peach season here, and why not? The pork is juicy and flavorful thanks to the brine and it's stint on the grill, and it pairs perfectly with the glaze and grilled peaches. I served this with goat cheese grits and grilled asparagus, and it was pretty much the perfect early-summer dinner. The whole meal embodied everything I love about southern cuisine - grits, pork, peaches, seasonal, and most of all, loved by the whole family! Combine the salt and brown sugar in a large heatproof bowl. Add the boiling water and stir to dissolve, then stir in the ice cubes. Stir until the water has cooled to warm room temperature, and add the pork tenderloins. Cover the bowl with plastic wrap and refrigerate 30 minutes (Don't brine any longer, or the pork will be too salty!). Meanwhile, stir together the peach preserves, rosemary, and Dijon. Season to taste with salt and pepper. Remove the tenderloins from the brine, rinse well, and pat dry with paper towels. Season with black pepper. Grill, turning once, until the internal temperature reaches 145 degrees, about 15 minutes. During the last few minutes, brush with the peach-dijon mixture. Remove to a cutting board and cover with aluminum foil. Allow to rest about 5 to 10 minutes. Slice on the diagonal and serve immediately with the remaining sauce. Beautifully said, Josie. To me, Southern food is the epitome of cooking with love. A grill does something magical to peaches. I bet this is sumptuous! Goat cheese grits?! I'm going to need that recipe too. This entire meal sounds perfect. beautiful post, lady. I have to make this very soon.